Products that cost more than €2.000 can only be purchased in our store. You can contact us here, we're happy to answer all your questions. 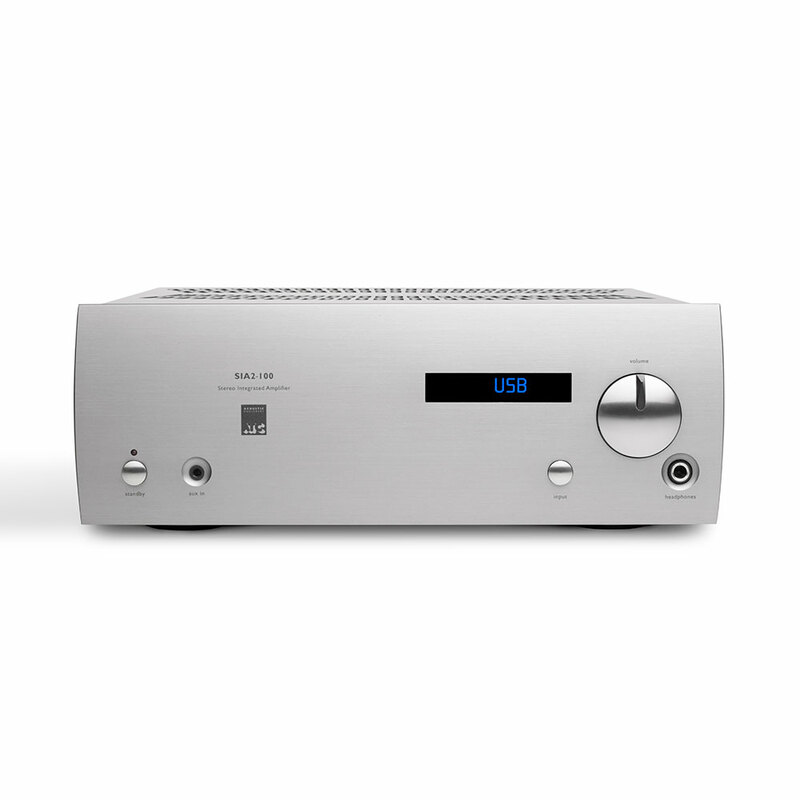 Compact in size (2/3 width) yet offering high power output and exceptional resolution, this integrated amplifier with on-board DAC is ideally suited to driving ATC’s small & mid-size passive loudspeakers and a very wide range of loudspeakers from other manufacturers. Understated styling makes it easy to integrate with partnering equipment whilst its small footprint occupies very little space in the home. 2 x line level analogue inputs. 3 x digital inputs: USB, Coaxial, TOSLINK. ATC Discrete MOSFET Output Stage with 100W/Ch. Max. Cont. Power. Headphone amp featuring discrete output stage. *DSD256 support via PC only (up to DSD128 via Mac). ATC’s discrete analogue design and use of multiple local power supply regulators provides the optimum operational platform for the SIA2-100’s AKM onboard DAC and USB receiver. The USB input will handle PCM sample rates from 44.1 kHz to 384 kHz, with word lengths to 32 bits, and also decode DSD sources at 2.822 MHz (Single rate, DSD64), 5.644 MHz (Double rate, DSD128). All inputs, analogue and digital, achieve distortion figures below 0.001%. The SIA2-100 incorporates a headphone amplifier and a 3.5mm auxiliary input with higher sensitivity, better suited to interfacing with portable audio devices. Both circuits have been designed to deliver the lowest levels of noise and distortion. The headphone amplifier is biased in class A and is specified to drive a range of headphones from 32 to 600 ohms. Specification Maximum Power Output: 100W (Continuous Av. 8 Ohms, 1kHz, both channels driven) Line Inputs: Two, stereo (one with additional front panel 3.5mm jack) Line Input Sensitivity: 500mV Input Impedance: 13k8 Ohms Line Outputs: One, stereo Overload Capacity: 13dB Line Output Impedance: 10 Ohms Frequency Response: < 2Hz – > 250kHz (@ -3dB) Total Harmonic Distortion: 1kHz <0.0015% (-96dB), 10kHz <0.002% (-90dB) Crosstalk: >80dB (10Hz – 20kHz) S+N/N Ratio: Wide Band > 96dB, DIN > 108dB, > IEC “A”112d Dimensions (HxWxD): 113 x 315 x 315mm / 4.4 x 12.4 x 12.4”Dimensions exclude rear panel connectors. Take care to leave space behind the unit for connectors and cables. Weight: 9.70kg (24.39lbs) DIGITAL INPUTS – COAXIAL & OPTICALDistortion: 1kHz <0.0015% (-96dB ), 10kHz <0.005% (-86dB) Frequency Response: 20Hz – 20kHz (+/- 0.1dB) S+N/N Ratio: >100dB (IEC “A”) Word Lengths Supported: 16 – 24 Bit Sample Rates Supported: 44.1kHz, 48kHz, 88.2kHz, 96kHz, 192kHz (192kHz supported via coaxial input only) DIGITAL INPUTS – USB (PCM) Distortion: 1kHz <0.0015% (-96dB ), 10kHz <0.005% (-86dB) Frequency Response: 20Hz – 50kHz (+/- 0.1dB)S+N/N Ratio: >100dB (IEC “A”) Word Lengths Supported: 16 – 32 Bit Sample Rates Supported: 32kHz, 44.1kHz, 48kHz, 88.2kHz, 96.0kHz, 76.4kHz, 192.0kHz, 352.8kHz, 384.0kHz DIGITAL INPUTS – USB (DSD) Frequency Response: 10Hz – 50kHz (+/- 0.1dB) S+N/N Ratio: >100dB (IEC “A”) DSD Rates Supported: Windows DSD64, DSD128, and DSD256, MAC OS DSD64 and DSD128ATC reserves the right to vary products and specifications without prior notice.